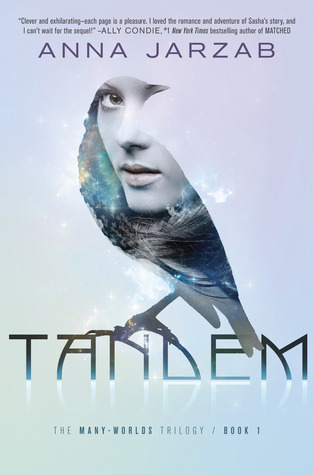 I got into Tandem thinking it is a dystopian novel, however I find out it involves parallel worlds, analogs, and a politically unstable monarchy in a parallel world to earth. I've mentioned before that I haven't read much parallel world novels (other than Pivot Point by Kasie West) so this was a great book to broaden my knowledge of this genre. Tandem, while not without flaws, was a pleasant and satisfying read with a whooping 430 pages that might not have all been exciting, but the concepts behind many of the laws that govern Tandem's worlds were very fascinating, especially when explained from a physicist's perspective. Sasha, the main protagonist, finds herself center stage in a political and dangerous world known as Aurora. She gets kidnapped by Grant's analog; Grant being a guy in her school she's crushed on for years. Sasha however is the analog of the princess of Aurora, to be exact, the missing princess of Aurora. Which is why she has to pretend to be Juliana (even from the Queen, her step-mom) until they find the real princess. Unfortunately nothing is as it seems and clues are revealed to us that perplex Sasha as well as the readers, conspiracy theories get thrown here and there (mostly by me) and you really get involved in trying to solve this whole mystery of who is really in power and who is backstabbing who.. and yes, be prepared for a ton of backstabbing in this book. I have to say that I was surprised by Sasha's dilemma when she had the option to go back to earth.. I mean, family always comes first but she was willing to sacrifice that for Grant's analog, Thomas, who you should all have guessed (or bet on your life) is the main love interest in Tandem. I didn't care much for the romance initially but I have to say Jarzab portrayed Thomas in a very appealing way. I loved his POVs and wanted to know more about him. The ending isn't a cliffhanger that causes your jaw to drop, and I liked that. Tandem was definitely a unique concept and I can't wait to read more about this parallel world theory as well as the direction the author is taking with this series. I think I am going to have to pick this up. I think it sounds great, and Sasha sounds like a fantastic character. Wonderful review. I think I'm going to really like this book. The whole concept of parallel worlds is so fascinating! :) Great review. I really wanted this book when I first saw it, but just didn't pick it up for one reason or another. (Something else likely caught my attention more) But now I am somewhat unsure if I want to get it. I loved the concept of the parallel universe, but not sure if I would like a heavy political anarchy plot line. Hmmm, lots to think about with this one. Haven't heard of this book before. Great review! Maybe it's wrong, but I actually am often turned off of books the names of the characters and I feel like this is something many readers feel but don't agree with! Sasha, hm, I feel it would bother me to read continually. The plot sounds great and the cover is absolutely gorgeous. Awesome review, I'll make sure to come here for recommendations more often! I hate parallel worlds, they're so confusing!! Sasha sounds like a character who would bug me, choosing a guy over going home to her family?!? This is one I'll be passing on.